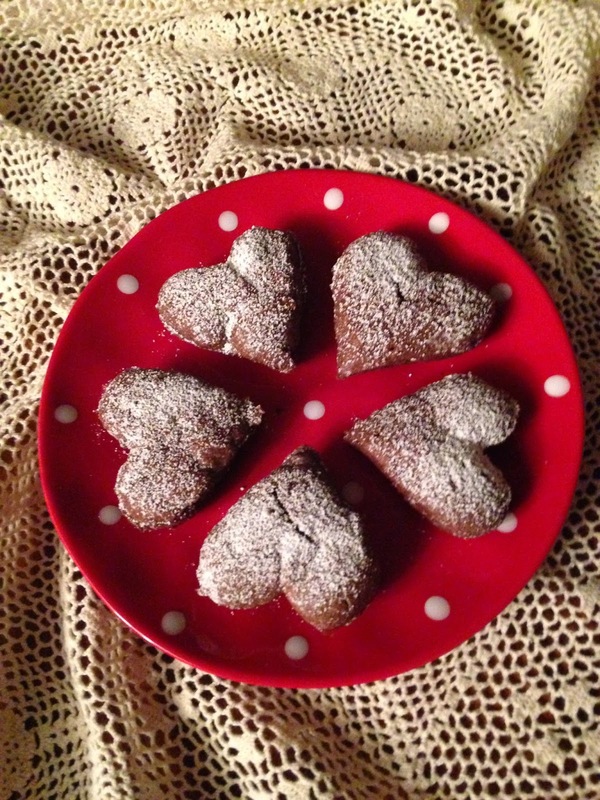 A number of years ago, I found a recipe in Country Living Magazine for heart-shaped chocolate Madeleine cakes. It was a Valentine edition with a shopper's guide to purchase the special cast-iron mold. 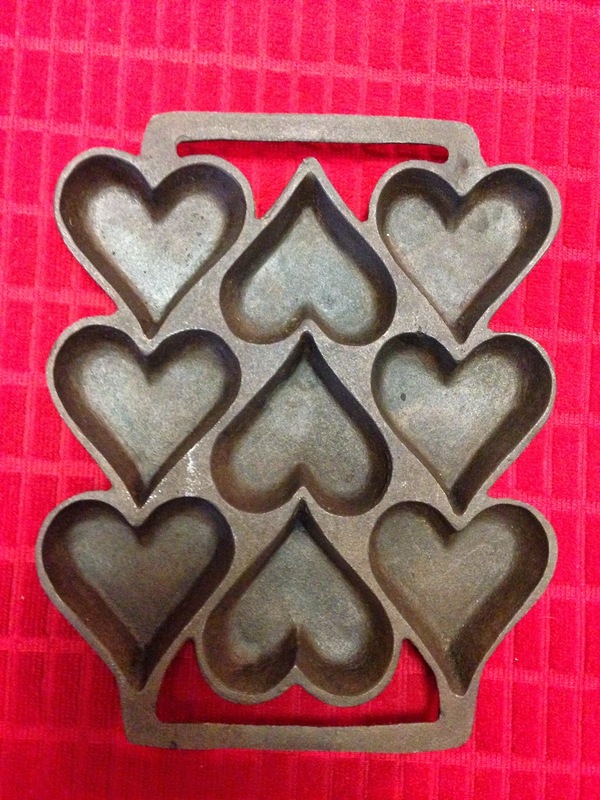 I've long since lost the recipe although I've kept the mold and have used it periodically for brownies and cupcakes when I want the fun flair of a heart-shaped dessert. Since Valentine's Day is just around the corner, I thought I'd share the history of Madeleines (the original version) and a chocolate version. Madeleine is a French form of Magdalen (Mary Magdalen, a disciple of Jesus, is mentioned in all four gospels. There are several versions on the origin of Madeleine cakes, but the two most popular ones hail from the 18th century and the little French town of Commercy, of the Lorraine region. One: Nuns in France during the 18th century frequently supported themselves (and their schools) by making and selling a particular sweet. Commercy was home to a convent dedicated to St. Mary Magdalen, but during the French Revolution, all the convents and monasteries of France were abolished, and legend has it that the nuns sold their recipe for Madeleine Cakes for a large sum of money to bakers there when their convent closed. Version Two: A young servant girl named Madeleine in Commercy, France, made them for Stanislas Leszcaynska, the deposed king of Poland, when he was exiled to Lorraine. He gave the delicate cakes the name Madeleines. His daughter Marie, who was married to Louis XV (1710-1774), was quite fond of them. They became wildly popular in Versailles, where they are still made today. So what are Madeleine cakes? They are small delicate sponge cakes with a distinctive shell-like shape derived from the special pans they are baked in. Aside from the special pan, no other special tools or ingredients are needed. The traditional recipe is made with vanilla or a lemon zest. I've included instructions for both the traditional and chocolate versions. Preparation: Cream the butter and granulated sugar on high until it is light and fluffy. Add the vanilla extract and orange zest to the butter. Turn the mixer to low speed and add the eggs, one at a time, scraping down the sides of the bowl with a spatula as needed. Beat the mixture on medium-high for about 3 to 4 minutes, until the mixture has lightened in color and is very fluffy. In a separate bowl, mix together the flour and baking powder. Very gently fold the flour and baking powder into the egg mixture. Once the batter is smooth, cover it and transfer it to the refrigerator for 2 hours. Preheat the oven to 375F. Generously grease 2 standard Madeleine pans and spoon the cold batter into the molds. Bake them for 10 to 13 minutes, until they are puffed and turn golden brown. Invert the pans onto wire racks and give them a hard tap to remove the cookies from the molds. Serve them warm dusted with a bit of confectioners’ sugar for the best flavor. 1. Sift together the flour, cocoa and the salt. 2. Place the eggs and the sugar in a large bowl or the bowl of an electric mixer and whisk until thick and lemon-colored. Fold in the flour, then melted butter. 3. Butter the Madeleine pans generously, then spoon in the batter, filling each about three fourths full. Refrigerate the filled Madeleine pans and the remaining batter for one hour. 4. Heat the oven to 425°F (220°C). 5. Bake the Madeleines just until they are firm and puffed, about 7 minutes. Turn them immediately from the molds, wipe out the molds, let cool and continue baking the Madeleines until all of the batter is used. The Madeleines are best when eaten slightly warm or at room temperature the same day they are made. • Make the dough up to three days in advance and chill it in the refrigerator. • Heavily butter the molds and chill them so the butter hardens before the molds are filled with batter. • Refrigerate the filled molds before baking. • Make sure the oven is fully hot before baking the Madeleines. • Bake for no longer than 7 minutes — the Madeleines should not quite spring back when you touch them. This ensures a moist result. Wouldn't these be the perfect ending to your Valentine dinner? Are there foods you make that have an ethnic origin or story behind them? I'd love to hear from you in the comments below. Yummmm! The French have a number of traditional pastries that are wonderful. Our daughter worked in France during the 2013/2014 school year, and we got to visit her over Christmas that year. The French bakeries were filled with yule log cakes (buche de noel) that were beautiful. On January 6, Epiphany, we were invited to the home of one of our daughter's colleagues where we got to enjoy a gallette, which is sponge-like cake that has a small token hidden inside. The youngest member of the party chooses who gets each piece of cake. Each person hopes to find the token, which signifies good luck in the coming year. We didn't experience the Madeleine cakes while we were there, though. I'll have to ask our new French friend when she serves them. Thank you for this enchanting blog. I just bought madeleine molds at an estate sale with the idea in mind of having a grand-daughter grandma moment but I've been afraid to try it. With the "tips" in this blog, I'm going to schedule a date. Oh, you should try them! Use gobs of butter in the molds and refrigerate as instructed. The batter is thick, between batter and cookie dough. Glad this was of interest to you. Have fun with your granddaughter. I'm glad you know what they are now!!! It's fun to learn the origins of recipes, don't you think? I read your blog on Thursday morning, but didn't have time to leave a comment. When I went to the store yesterday, I walked through the bakery department and had to laugh. There at the front was a big display of Madeleines and they looked just like the ones in your picture. I almost bought a package, but decided I didn't need all those calories because I'd be the only one eating them, and they are good. Thanks for the story behind them. And I just now saw your post, Martha!! Enjoying a good laugh with you!